In Origin of Species (1859), Darwin provided evidence that natural selection was the basis for evolution and, while recognizing that heritable traits were being passed from parents to offspring, was unaware of how this occurred. In 1866, Mendel presented a model whereby heritable units (now called genes) were transmitted, and that alternate forms of this unit (alleles) were present on the chromosome that would be expressed in offspring as a trait. Scientists were faced with the dilemma of reconciling Mendel’s evidence for large changes passed from parent to offspring with Darwin’s theory involving gradual generational changes. In 1908, the English mathematician Godfrey Hardy and the German physician Wilhelm Weinberg independently developed a model to determine whether evolution has occurred and detect whether any changes in gene frequencies in the population took place. If no evolution was occurring, an equilibrium of allele frequencies would remain in effect in each generation of reproducing individuals. But in order for equilibrium to occur, each of the following five conditions had to be satisfied: the population must be infinitely large to prevent genetic drift (the random chance that allele frequencies would change); mating must be random, with individuals pairing by chance; no mutations can occur, thereby preventing the introduction of new alleles into the population; no individuals can move into or out of the population; and no natural selection can occur, thereby certain alleles are not preferred or excluded. In real life, these conditions would never be met and, therefore, evolution would occur. The formulas made possible the detection of allele frequencies changing from generation to generation proving that evolution is occurring while allowing scientists to estimate the percentage of a population carrying an allele for an inherited disease. Throughout much of the twentieth century, the study of genetics was dominated by English speakers who were unaware of Weinberg’s German paper, which had introduced the concept six months earlier in 1908. Therefore, until 1943, the Hardy-Weinberg Equilibrium was solely attributed to Hardy. The Hardy-Weinberg equilibrium provides a mathematical model to detect changes in population gene frequencies. 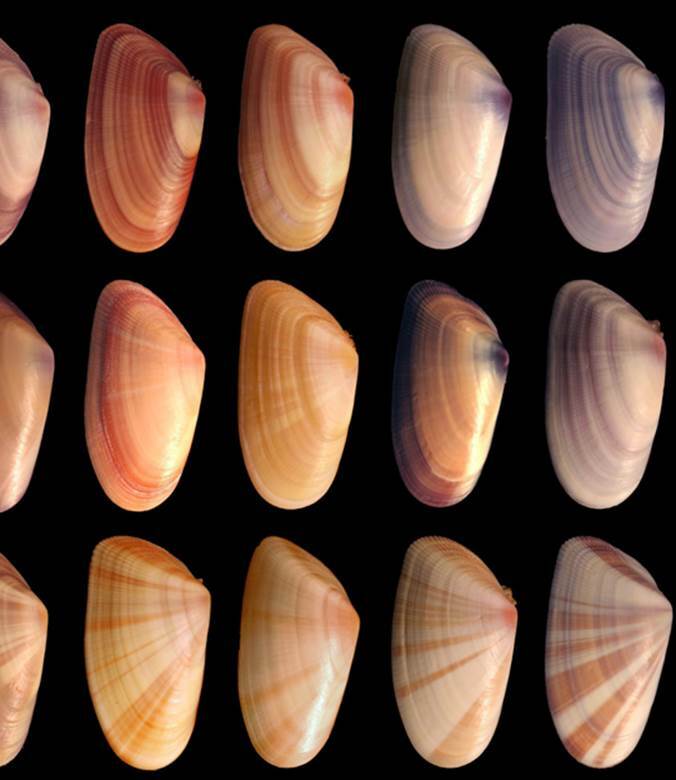 This collection of Donax variabilis shells shows diverse coloration and patterning based on differences in their genotypes.